The Northrop Gamma 2F was an attack bomber derivative of the Northrop Gamma transport aircraft, developed in parallel with the Northrop Gamma 2C, (of which one was built), designated the YA-13 and XA-16. The Gamma 2F had a revised tail, cockpit canopy and wing flaps compared with the Gamma 2C, and was fitted with new semi-retractable landing gear. It was delivered to the United States Army Air Corps for tests on 6 October 1934, and after modifications which included fitting with a conventional fixed landing gear, was accepted by the Air Corps. A total of 110 aircraft were ordered as the A-17 in 1935. The resulting A-17 was equipped with perforated flaps, and had fixed landing gear with partial fairings. It was fitted with an internal fuselage bomb bay that carried fragmentation bombs and well as external bomb racks. Northrop developed new landing gear, this time completely retractable, producing the A-17A variant. This version was again purchased by the Army Air Corps, who placed orders for 129 aircraft. By the time these were delivered, the Northrop Corporation had been taken over by Douglas Aircraft Company, export models being known as the Douglas Model 8. From 14 December 1941, A-17s were used for coastal patrols by the 59th Bombardment Squadron (Light) on the Pacific side of the Panama Canal. Argentina purchased 30 Model 8A-2s in 1937 and received them between February and March 1938; their serial numbers were between 348 and 377. These remained in frontline service until replaced by the I.Ae. 24 Calquin, continuing in service as trainers and reconnaissance aircraft until their last flight in 1954. Peru ordered ten Model 8A-3Ps, these being delivered from 1938 onwards. These aircraft were used in combat by Peru in the Ecuadorian-Peruvian war of July 1941. The survivors of these aircraft were supplemented by 13 Model 8A-5s from Norway (see below), delivered via the United States in 1943 (designated A-33). These remained in service until 1958. The Swedish government purchased a licence for production of a Mercury-powered version, building 63 B 5Bs and 31 B 5Cs, production taking place from 1938 to 1941. They were replaced in service with the Swedish Air Force by SAAB 17s from 1944. The Swedish version was used as a dive bomber and as such it featured prominently in the 1941 film Första divisionen. The Netherlands, in urgent need of modern combat aircraft, placed an order for 18 Model 8A-3Ns in 1939, with all being delivered by the end of the year. Used in a fighter role for which they were unsuited, the majority were destroyed by Luftwaffe attacks on 10 May 1940, the first day of the German invasion. Iraq purchased 15 Model 8A-4s, in 1940. They were destroyed in the Anglo-Iraqi War in 1941. Norway ordered 36 Model 8A-5Ns in 1940. These were not ready by the time of the German Invasion of Norway and were diverted to the Norwegian training camp in Canada, which became known as Little Norway. Norway decided to sell 18 of these aircraft as surplus to Peru, but these were embargoed by the United States, who requisitioned the aircraft, using them as trainers, designating them the A-33. Norway sold their surviving aircraft to Peru in 1943. In June 1940, 93 ex-USAAC aircraft were purchased by France, and refurbished by Douglas, including being given new engines. These were not delivered before the fall of France and 61 were taken over by the British Purchasing Commission for the British Commonwealth use under the name Northrop Nomad Mk I. After the RAF assessed the Northrop Nomad Mk Is as "obsolete", most of the Nomads were sent to South Africa for use as trainers and target tugs. The Nomads suffered shortages of spare parts (particularly engines) and from 1942 were gradually replaced by Fairey Battles. The last Nomads were retired in 1944. Initial production for USAAC. Fixed gear, powered by 750 hp (559 kW) Pratt & Whitney R-1535-11 Twin Wasp Jr engine; 110 built. Revised version for USAAC with retractable gear and 825 hp (615 kW) R-1535-13 engine; 129 built. Three seat staff transport version for USAAC. Powered by 600 hp (447 kW) Pratt & Whitney R-1340 Wasp engine; two built. Export version for Sweden. Fixed gear. Two Douglas built prototypes (Swedish designation B 5A), followed by 63 licensed built (by ASJA) B 5B aircraft powered by 920 hp (686 kW) Bristol Mercury XXIV engine; 31 similar B 5C built by SAAB. Version for Argentina. Fitted with fixed gear, ventral gun position and powered by 840 kW (1,126 hp) Wright R-1820-G3 Cyclone; 30 built. Version of A-17A for Netherlands. Powered by 1,100 hp (820 kW) Pratt & Whitney R-1830 Twin Wasp S3C-G engine; 18 built. Version of A-17A for Peru. Powered by 1,000 hp (746 kW) GR-1820-G103 engine; ten built. Version for Iraq, powered by a 1,000 hp (746 kW) GR-1820-G103 engine; 15 built. Version for Norway, powered by 1,200 hp (895 kW) GR-1830-G205A engine; 36 built. Later impressed into USAAF service as Douglas A-33..
8A-3P 4? ?, ex-31o Escuadrón de Ataque y Reconocimiento. On display at the FAP museum, Las Palmas Peruvian Air Force Base. RCAF Nomad 3521 crashed in Lake Muskoka, Ontario December 13, 1940. The wreck was found in July 2010 and both aircraft and the crew's remains were recovered by the RCAF. The recovered aircraft will be put on display at the National Air Force Museum of Canada, Trenton, Ontario. ^ Pelletier Air Enthusiast May–June 1998. pp. 63–64. ^ "A-17/8A Light Attack Bomber." Archived 2008-01-26 at the Wayback Machine Boeing. Retrieved: 11 February 2008. ^ a b Pelletier Air Enthusiast May–June 1998, p. 65. ^ a b Pelletier Air Enthusiast May–June 1998, p. 66. ^ a b Pelletier Air Enthusiast May–June 1998, pp. 64–65. ^ a b c Fact Sheet – A-17A National Museum of the United States Air Force. Retrieved: 16 July 2017. ^ Conaway, William. "VI Bombardment Command History." Planes and Pilots Of World War Two. Retrieved: 6 August 2011. ^ Pelletier Air Enthusiast May–June 1998, p. 67. ^ a b c Pelletier Air Enthusiast September/October 1998, p. 2. ^ a b c Pelletier Air Enthusiast September/October 1998, p. 6. ^ a b Pelletier Air Enthusiast September/October 1998, pp. 12–13. ^ a b Pelletier Air Enthusiast September/October 1998, pp. 3–4. ^ a b c d e Pelletier Air Enthusiast September/October 1998, p. 3. ^ Pelletier Air Enthusiast September/October 1998, p. 4. ^ a b c Pelletier Air Enthusiast September/October 1998, pp. 4, 6. ^ Donald 1995, p. 212. ^ a b Pelletier Air Enthusiast September/October 1998, p. 12. ^ "Fact Sheet – A-17A." National Museum of the United States Air Force. Retrieved: 16 July 2017. ^ Francillon 1979, pp. 212–213. ^ Francillon 1979, pp. 213–214. ^ Francillon 1979, p. 215. ^ Francillon 1979, p. 218. ^ Francillon 1979, pp. 219–220. ^ Francillon 1979, pp. 218–219. ^ a b Francillon 1979, p. 220. ^ "Museum FAP 8A-3P". Flankers-site.co.uk. Retrieved 2013-11-17. ^ "8A-3P on display." geocities.com. Retrieved: 6 August 2011. ^ "Nomad Aircraft Recovery Completed". Royal Canadian Air Force Public Affairs. Retrieved 2014-11-22. Bontti, Sergio and Jorge Núñez Padín, eds. "Northrop 8A-2 (in Spanish)". Serie Fuerza Aérea Argentina #8, October 2003. Donald, David, ed. American Warplanes of World War II. London: Aerospace, 1995. ISBN 1-874023-72-7. Pelletier, Alain J. "Northrop's Connection: The unsung A-17 attack aircraft and its legacy – Part 1". Air Enthusiast, No. 75, May–June 1998, pp. 62–67. Stamford, Lincolnshire: Key Publishing. ISSN 0143-5450. Pelletier, Alain J. "Northrop's Connection: The unsung A-17 attack aircraft and its legacy – Part 2". Air Enthusiast, No. 77, September/October 1998, pp. 2–15. Stamford, Lincolnshire: Key Publishing. ISSN 0143-5450. Widfeldt, Bo and Åke Hall. B 5 Störtbombepoken (in Swedish). Nässjö, Sweden: Air Historic Research AB U.B., 2000. ISBN 91-971605-7-1. 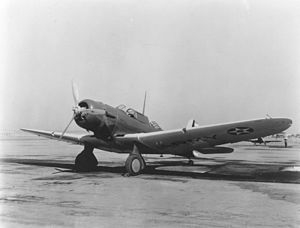 Wikimedia Commons has media related to Northrop A-17.